Thanks to Stefan Jones, I now have a full SpectraVideo 328 system! It includes the expansion unit, that plugs onto the back of the main unit. The expansion unit provides slots for various cards, kinda like a PC today. Included in this system were an 80 column graphics card, a printer interface card, and a floppy disk controller card. 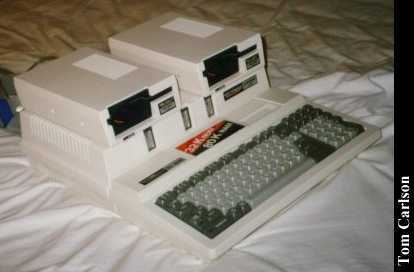 The two floppy drives simply sit on top the expansion unit case. I've taken a load of pictures of this gem. Take a look. Once upon a time, Bill Gates wanted to break into the Japanese computer market. 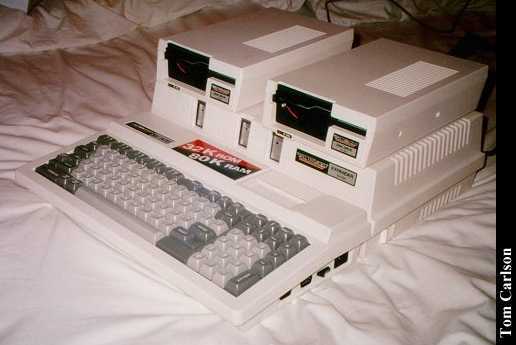 He tried to set up a standard, called MSX, so that different brands could swap software and components. Each computer would be compatible with the others, but could include special features of its own. Many of the MSX computers had special music hardware and could be hooked up to piano-type keyboards. One American company, SpectaVideo, decided to join the Japanese companies. Before it actually produced any real MSX compatible computers, it produced 2 wonderful quasi-MSX 8-bits computers, the 318 and the 328. 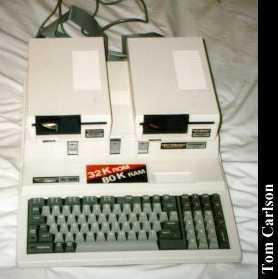 The 318 had a chiclet keyboard with built in joystick and 32K RAM. The 328 had a real keyboard and 64K RAM. 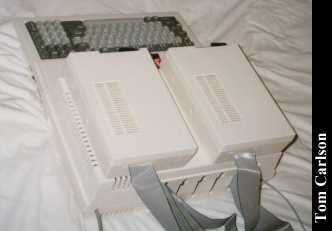 Both computers ran off a Zilog Z80 chip. Both had 32K worth of BASIC in ROM, which resulted in one of the finer versions of BASIC ever produced. They also had good sound and graphic ability, although the graphics were not quite as good as a C64. My 328 has a tape drive. Disks drives were also available. In the end, the Japanese MSX standard never caught on. (See? Bill doesn't always win.) The only non-SpectraVideo MSX computers I have ever seen were in a musical instrument store, years ago. There is an MSX Computer Club in Australia, the Melbourne MSX-Spectravideo Users Group. Harry Fox and Oscar Jutzler (two Swiss clock/watch makers who had moved to North America in the 1950s) made the SVI-318 and introduced it on the market. It was not a very big success, so in 1983 they asked Kazuhiro Nishi (also known as Kay Nishi) the head of ASCII Microsoft Japan, to help them redesign their computer. Kay Nishi agreed to help them, on the condition, he could base his MSX standard on the SVI design that he would do. 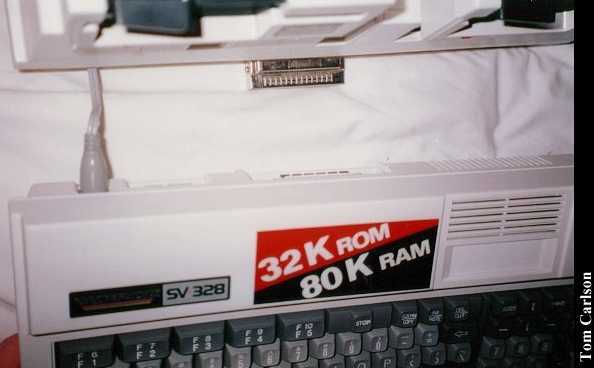 He then supplied the BASIC which is very close to the MSX-BASIC and remodelled the keyboard and expanded the RAM from 32k to 64k and released it as the SVI-328. 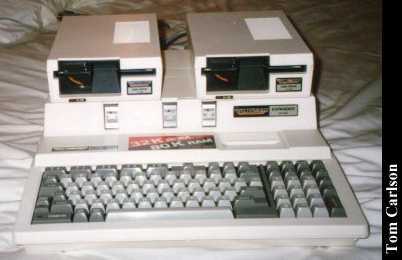 The idea behind MSX was that it would become a world standard for computers. (Much like other electrical appliances or devices adhere to, such as VCRs or lamps. A VCR of one brand will play tapes recorded by another brand of VCR. No matter which incadescent lamp you buy, the same light bulbs that will work in it, will work in other light sockets in your house as well.) It was to allow the interchange and addition of peripherals used on any of the MSX machines that were made by any of the MSX manufacturers. 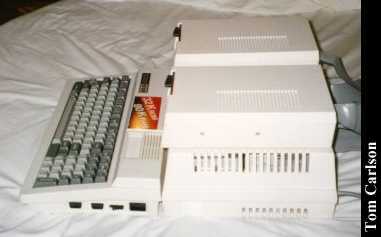 It would also allow for a larger software base that could be shared by all MSX computers. (You have to remember back in 1983 the computer market was very badly fragmented with IBM, Apple, Radio Shack, Commodore, Atari, Texas Instruments, Timex Sinclair and a host of CP/M based machines, all vying for the same support from manufacturers and market but for all those different types of machines and operating systems!) The MSX standard was supposed to eliminate that. Bill Gates though, being the head of Microsoft internationally, had no wish to alienate the world's then largest computer manufacturer IBM and his client for MS-DOS (which was relatively new on the market), was not very supportive of MSX becoming a world-wide standard. 72 key keyboard with 5 function keys, cursor control pad, and three other specialized keys. Some of the companies to jump on the MSX bandwagon were: Spectravideo, Yamaha, Philips, Toshiba, Sanyo, Sony, Daewoo, Mitsubishi, Pioneer, and Panasonic among others. Out of all the MSX computers to become available internationally, the only MSX computer to be sold in North America was the Yamaha computer which had a MIDI-interface incorporated in it. Yamaha North America though, insisted on selling it as a musical device rather than as a personal computer. PCs in recent years, such as the CD-ROM drive, MIDI-interface cards and 3.5 inch diskettes to name a few. Front view of entire system, shot straight on. Front view of entire system, but from a higher vantage point. 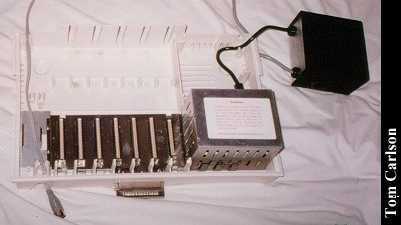 Rear view of system showing the cables routed out the back. Side view of system. Shows ventilation slots in expansion unit cover, as well as joystick ports, power switch and power jack on side of main unit. 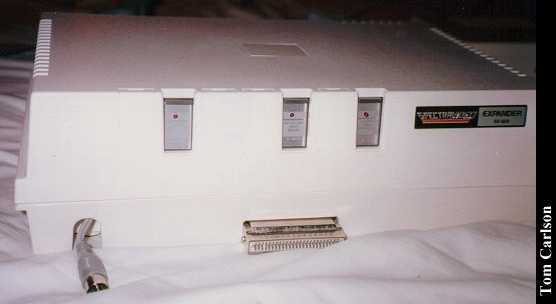 View of expansion unit with top, cards, and power supply removed. You can see where the power supply sits in the upper right corner of the unit. You can also see the normal A/V cable route through the case on the left side. Group shot showing the main unit in the foreground, the expansion unit on the left, the top to the expansion unit on the right, and one of the cards leaning against the expansion unit in the center. Classic 3/4 view, from the other quarter. 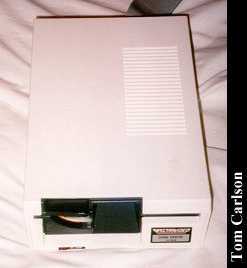 View of one of the floppy disk drives. 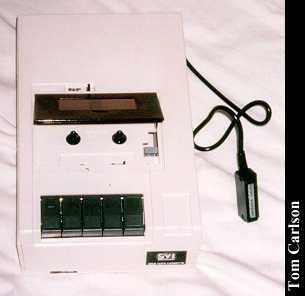 View of the cassette recorder. The expansion unit doesn't leave room to plug the cassette recrder in, so I guess you're not supposed to use it with an expanded system. Makes a little hard to copy tape files to disk. Front view of expansion unit when not attached to main SV-328 unit. The plug on the left is the normal A/V cable, which simply passes through a hole in the front. The edge connector in the center plugs into the back of the SV-328. 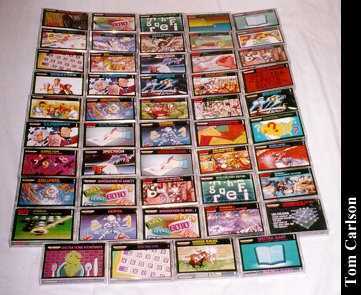 The various cards show through openings in the expansion unit. Kinda handy in that you can always see what cards you have installed. There are little white plugs that fill in the holes for slots without cards. 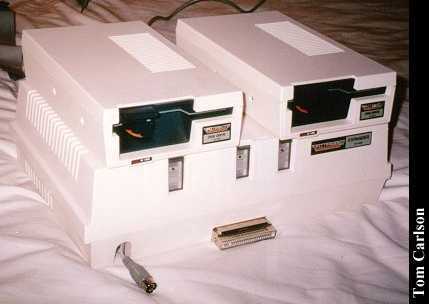 View of expansion unit with the two floppy drives on top. Close-up attempting to show you how the main SV-328 unit and the expansion unit plugged together. View of expansion unit with top of case removed. The grey cable on the left is the normal A/V cable. 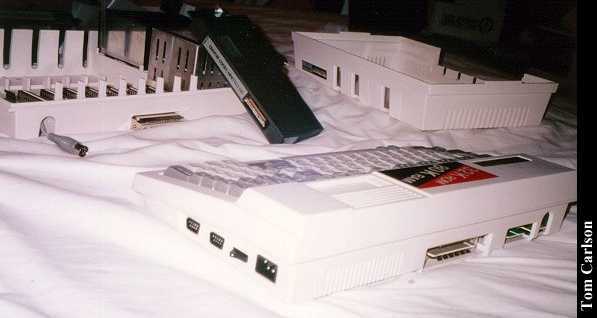 Three of the slots are taken up with, from left to right, the printer interface card, the 80 column graphics card, and the floppy drive controller card. The power supply for the expansion unit nests into the top right of the case. As you can see, all the cables route through slots in the back. 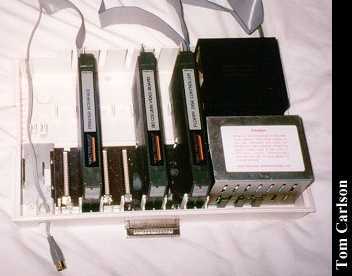 SV-328 typically came with lots of cassette-based software. I count 49 here. There were a bunch more not in cases. 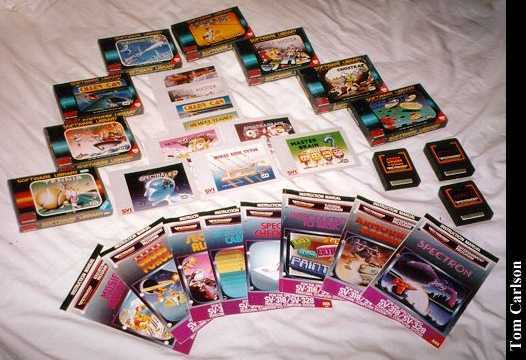 More software, including cassettes, cartridges, and manuals. 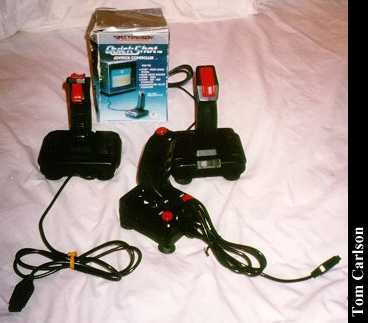 The SV-328 used normal digital joysticks, just like a C64 or Atari 2600. The ones that SpectraVideo made where quite good. Old fuzzy picture of my old SV-328. Click here to view all comments for the SpectraVideo 328 and to leave your own. Click here to view comments about other SpectraVideo computers.